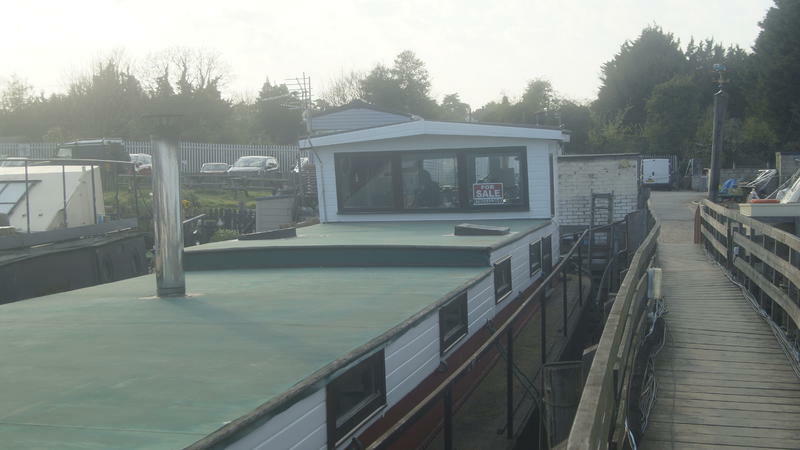 Premier Houseboats are pleased to present Debralee, a converted tank barge which is now a characterful home, in an excellent position and offering superb views. Debralee has been well converted to provide great space, excellent headroom and good use of every area. You enter into the wheelhouse area, which is now a fitted kitchen. There is plenty of work surface and storage to make this a comfortable space, with lots of windows that offer great light. Wide stairs lead down to a large lounge, the focal point of which is the log burning stove which compliments the central heating already in place. This main living area is well finished, and surprisingly light whilst also offering privacy. Headroom throughout is superb. A corridor leads to a guest double bedroom, an excellent size with room for plenty of storage if required. The family bathroom has toilet, bath with shower attachment, and a hand basin. Further along is the main bedroom, a great sized double again with plenty or room for storage. Externally there is a large area that could be easily decked to provide plenty of space to enjoy the views and surroundings. Moored just a 15 minute walk from Strood town centre and station, and a 20 minute walk from Rochester, she is ideally placed to enjoy quiet surroundings whilst having all the facilities you need close at hand. Debralee offers great space, secure surroundings and convenience of location. Vessel name: Debralee Vessel condition: Good Year constructed: 1950 Year refitted: 2007 Berths: 4 Cabins: 2 Heads: 1 Length over all: 74' Beam: 14' Hull material: Steel Hull type: Flat Hull colour: Black Disclaimer Premier Houseboats offers the details of this advert in good faith as it was presented by the seller or his representative but cannot guarantee or warrant the accuracy of this information nor warrant the condition of the described item within this advert. A buyer should instruct his agents, or his surveyors, to investigate such details as the buyer desires validated. The Item described within this advert is offered subject to prior sale, price change, or withdrawal without notice.